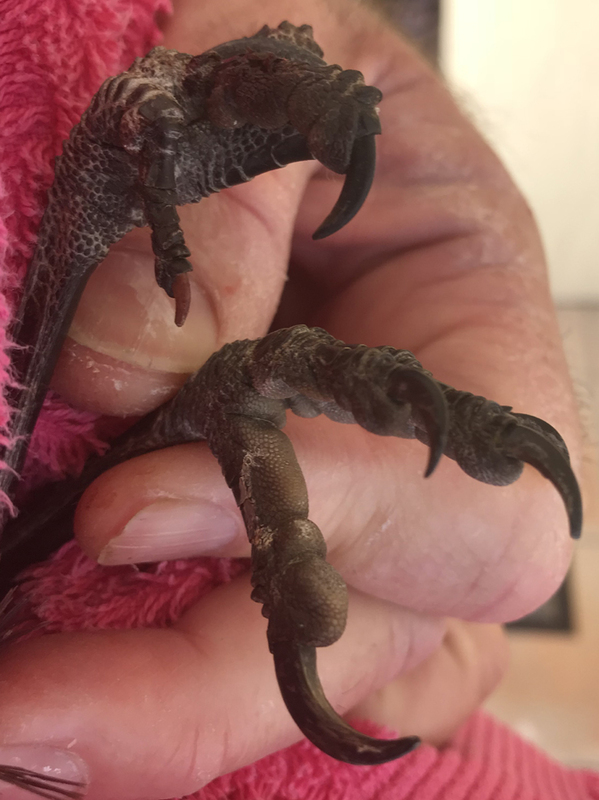 October was steady at Wild Bird Rescues with 30 sick or injured birds receiving help. In fact, exactly the same number of rescues as last month. 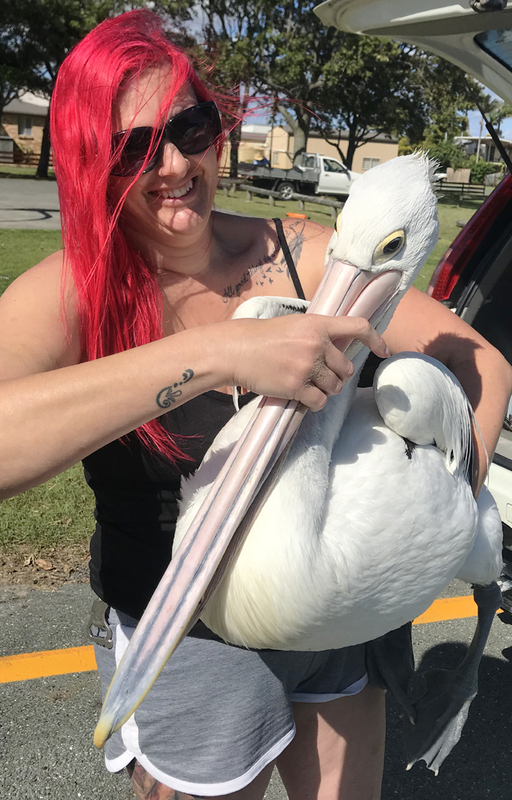 Spotter Sandy (of the flaming red hair) pulled off a specky catch when she sidled up and pounced on this peli. 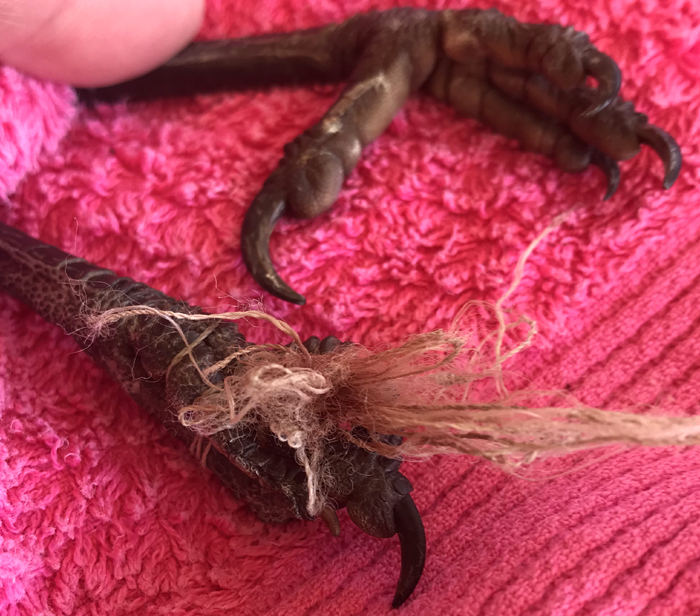 Sandy had come across the creature the day before on the sand at Cabbage Tree (30k’s north of Surfers), obviously in trouble, with fishing line and a hook visible in its left hock (knee). I raced to the scene. Following reports that people had walked right up to the bird and stood over it I tried the same, only rushing the last 2 meters and attempting a grab. But the peli wasn’t having any of it and bolted. I kicked myself for losing a desperately ill bird. Had I used another method it would have been an easy catch. Of course we’re all wise in hindsight! The next hour was spent searching but to no avail. So it came as great relief when Sandy called early again the next morning to say the peli was back on the beach at Cabbage Tree. After a long drive and with me only two minutes away she attempted to grab the bird … and succeeded. Lucky, because I would have murdered her if she’d missed it when I was so close. 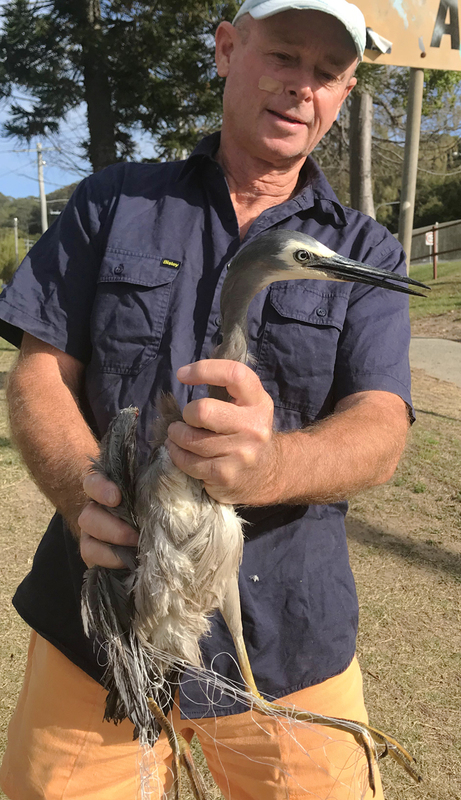 However, all’s well that ends well and 40 minutes later I admitted the critically ill pelican to Currumbin Wildlife Hospital. Pleased to say it was released, safe and well, 10 days later. Looks like a BIG eel is being naughty in Silverbank Lake, Varsity. A young swan and a cygnet were both savaged, all in the space of a few days, right in the same area. Eels can become a real problem if people regularly throw bread into the water to feed local birds. Bread doesn’t just attract swans, ducks, gulls and the like; it also attracts fish and eels. Those eels aren’t silly and soon habituate when they know regular food is available. 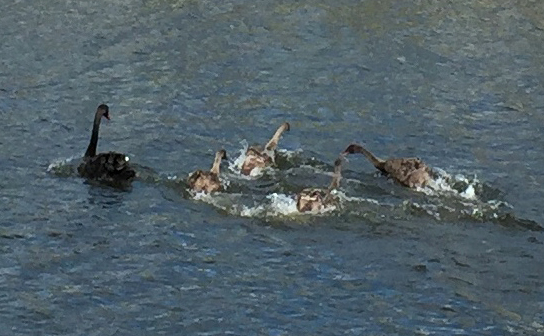 They become a huge risk to waterfowl, especially ducklings and cygnets, when all players turn up together for a feed. The first swan bitten was Lemon. He sustained a nasty tear across the webbing and middle toe of his left foot. 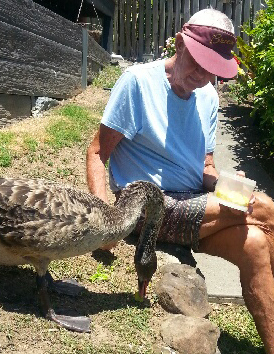 Caller Marina feeds local swans up in her garden. She noticed that Lemon was limping badly as he climbed out of the water for some lettuce. On my advice she quickly cordoned off the area to contain him. I arrived and after a quick look it was straight to hospital. 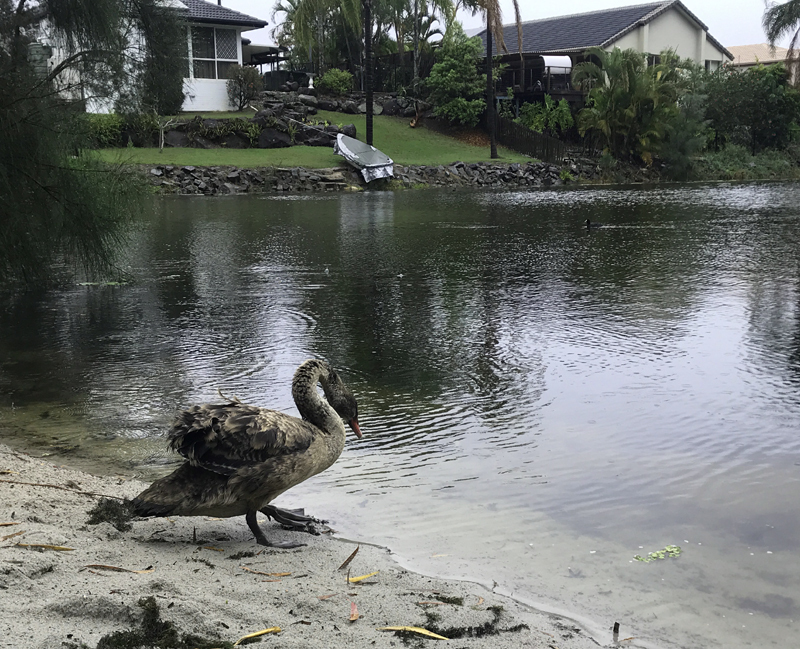 Just a few days later Marina called again to say that one of 4, eight week old cygnets from another family on Silverbank Lake had arrived with a nasty wound on its leg. It’s name was Clover and it was struggling to walk. This wound too was consistent with an eel bite. So, it was off to hospital for Clover. Lemon’s release date wasn’t important because he was fully grown, but Clover was a different matter. He would need to be re-united with his family quickly or risk rejection. In these cases I put pressure on the hospital to get the bird out as soon as possible, but of course there’s only so much they can do. For example, they can’t make stitches heal faster. Being a little older Clover wasn’t subject to the normal 48 hour window for safe re-introduction which applies to very young cygnets removed from a family. That was fortunate because it was a full 8 days before we got him back home. Happily the family accepted him without a problem. Two days later Lemon was also returned to the lake. Both of those birds were very lucky to survive an aggressive eel. I’m not aware of any bitings since. White-faced heron are one of my fav’s. They’re funny little fellows that screech ‘blue murder’ when you catch them. Being estuarine waders herons are particularly prone to fishing line entanglement. 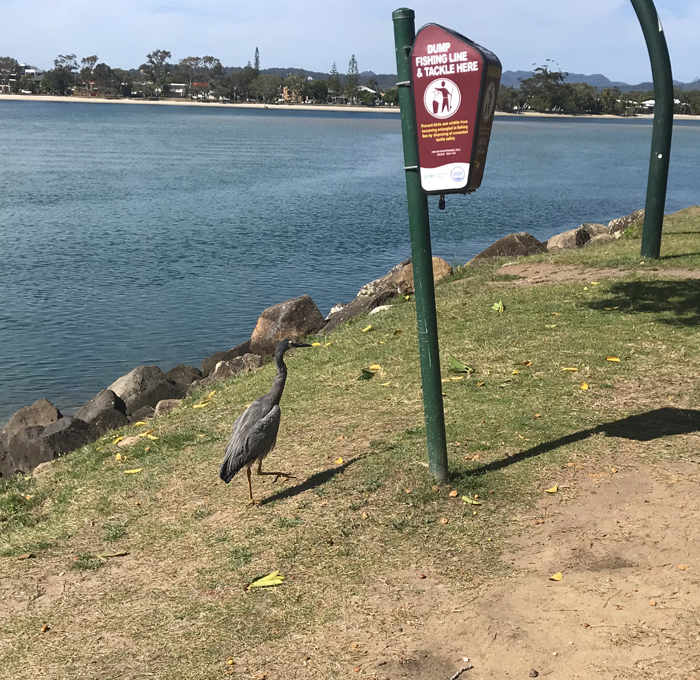 The call came early about a wf heron standing on a rock just offshore under the north end of Tallebudgera Creek Bridge. 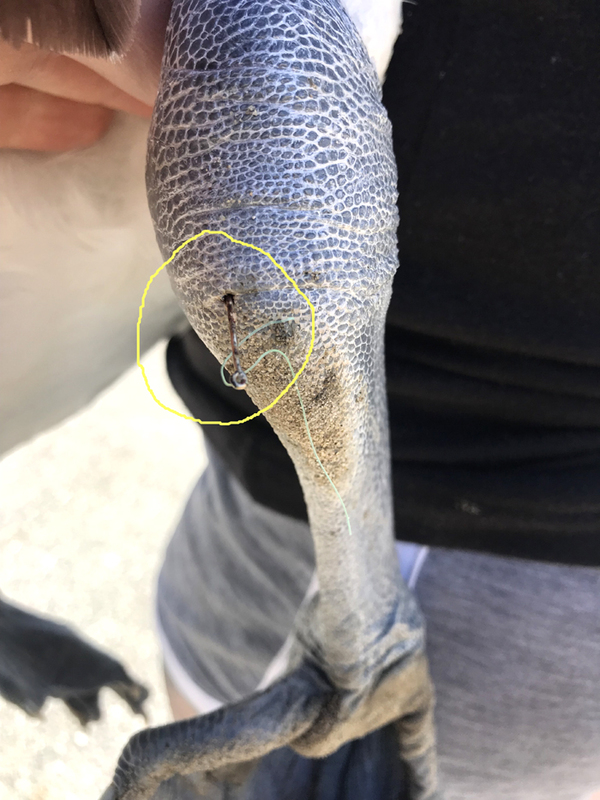 The caller could see fishing line but wasn’t sure if the bird was injured or whether it could still fly. 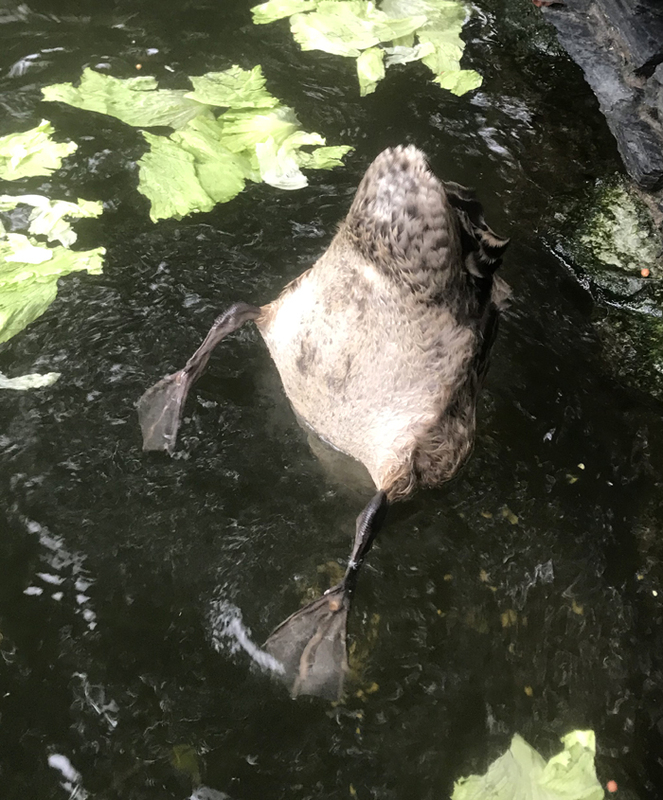 I always tell people that unless they can see a wing hanging low down, or lots of blood, ALWAYS assume that an injured bird can fly and don’t approach it … instead, phone for help and keep it in sight. Main Beach to Tally is quite a long drive. It would take me 25 minutes. Upon arrival the little fellow looked depressed and disheveled. I couldn’t know how active he was and so erred on the side of caution and blew a net over him. Turns out that wasn’t necessary because he wasn’t going anywhere. 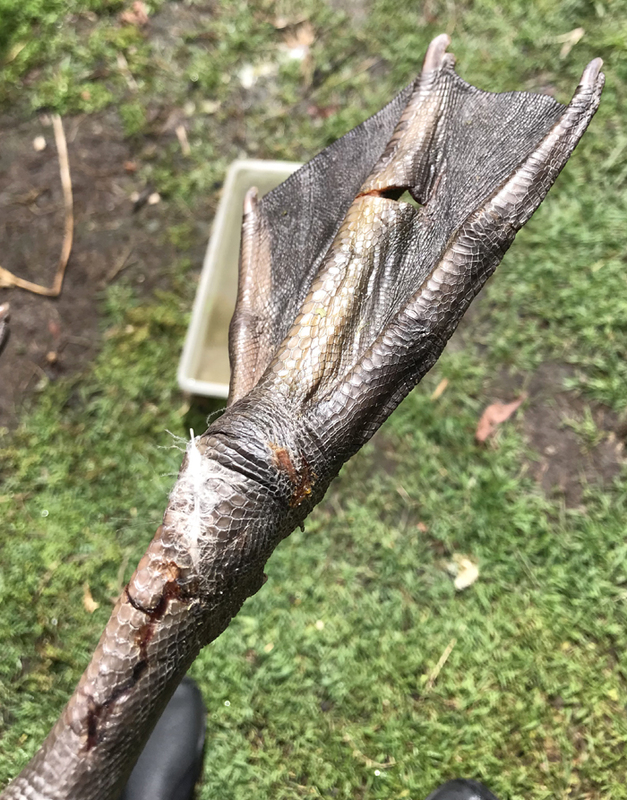 Damn fishing line was knotted tightly around the feathers on the tip of his right wing which had been pulled across his back then down underneath his left wing and tangled around his legs. No doubt bloody uncomfortable and with no hope of survival unless caught and disentangled. I named him Boris. I usually only name the birds I admit to hospital. Those creatures are often in care for a while and so they feel a bit like pets, albeit for a brief period only. The shorter the better. It’s fun to give them a name. The object of all wildlife carers is to get native creatures back into the wild as soon as possible. It took some time to cut the fishing line from Boris’s feathers and feet. Still weak I fed him a few white bait, which he promptly coughed back up, then released him immediately. 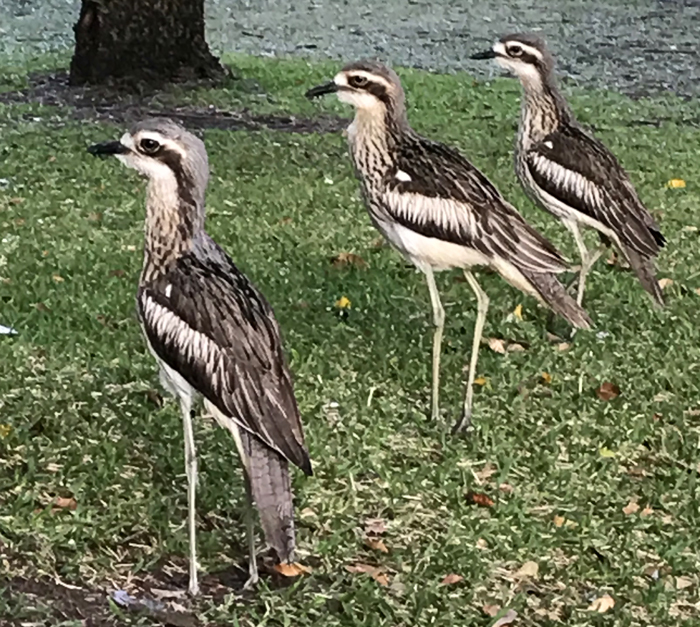 They’re hardly little blokes and I’m convinced that birds heal much quicker in the wild, free from the stress of containment and human contact. Instead of flying away, which I would have preferred, Boris strutted off down the lawn past the Tally Creek Tackle Bin which we’d installed two years earlier. I wasn’t happy with Boris being so exposed and prodded him until he jumped onto a rock closer to the water where approaching dogs could be seen. then I left him to rest confident he’d be OK. The stories in this report all have a happy ending. Ultimately this story does too. I can’t in good faith only tell you about successful outcomes while ommiting others. That would feel unbalanced. I’d named him Ringo. He’d lost his partner the day after she’d laid her eggs. Ringo sat on those eggs alone for six weeks until two new cygnets hatched. He raised the kids on his own for the next six weeks. Around that time a young boy went fishing. He was using bread for bait. Ringo ate the bread and became hooked. Locals could see him in distress with fishing line coming from his mouth. He was swimming frantically and couldn’t eat. His two kids had trouble just keeping up. It took me two days to catch Ringo. I didn’t try to take the little ones too because catching all together would likely take a while and potentially delay Ringo’s treatment. I was confident the young would remain in the area and be safe until I got their Dad home … hopefully in a couple of days only. Operating to remove a hook is a major undertaking, and risky; requiring at least a week of convalescence. Too long. Under pressure from me the vet opted to use a hook disgorger. This is also risky, but quick, meaning we might have Ringo back home with his kids in as little as 48 hours. But things don’t always go as planned in hospital, whether it be a human hospital or animal. The hook was deeply embedded and had done much damage. Removing it did even more damage. Ringo was still unable to eat. The vets and nurses did everything possible. He got special care and was otherwise bright and perky but because of his painful throat they had to tube feed him twice daily. As the days dragged on Ringo kept losing weight and his wings began to droop. In the meantime local residents were monitoring his two kids. They were doing OK, safe in their own little area of waterway which was free of potentially aggressive swans. I felt this was preferable to catching them and placing them in care. As time passed it became clear that Ringo wasn’t going to recover. There was nothing more the hospital could do. On day ten Dr. Pyne examined Ringo and made the difficult decision to put him to sleep. Vet nurse Natasha, who was very fond of Ringo, cried when she told me. I’ve stuck with my decision to leave the kids alone in their Carrara canal. It’s a very safe stretch of water for young swans (notwithstanding the universal risk of fish hooks) and I want them to grow up naturally if possible. I get regular reports. The two are about twelve weeks old now and doing well. Locals give them good quality food which encourages them to stay in the same area. In just a few weeks they’ll be able to fly, then a new phase of their life will begin. Never, ever bait a hook with bread. Caller Marilyn phoned very distressed about a maggie that visits her every morning. The bird had picked up a bad entanglement just a few days earlier and was rapidly going lame. The tyranny of distance is the problem in many rescues. Main Beach is reasonably central but I do get a LOT of calls from areas like Varsity. The back blocks of Varsity being a good 40k round trip from Main Beach, often through heavy traffic. It can take a while to get there and birds don’t wait around for rescuers. If I had a buck for every time I’d arrived, only to watch a target bird fly off and disappear, I’d be living in a mansion on Hedges Av with my own team of pastry chefs to ensure a robust supply you know what! There are ways to get around the distance issue, especially with maggies and pee wees, many of which are so humanised they’ll strut right in through an open doorway to get free tucker. If the caller, or an assistant, can quickly close the door behind the bird, trapping it inside, nine tenths of the battle is won. Even so, once trapped, most people aren’t able to catch a panicking bird as it flies madly around the room crapping on the furniture and threatening grandma’s priceless china. Of course I explain all this to callers before they trap a bird and most choose to ‘take the pain’ if it will ensure ‘their bird’ gets help. Marilyn wasn’t the least bit concerned about the china. At the first opportunity she shut the door behind the maggie and phoned me. The entanglement looked like threads of jute or sack of some kind. Whatever the material it was ridiculously tight and the poor maggie was in real trouble. 15 minutes of delicate cutting got it off and the creature was released, comfortable and happy for the first time in days. Is it just me or are manners in short supply these days, especially when people are texting? I receive some truly outstanding communications which can leave me feeling quite indignant. I don’t say that of course, but I do think basic politeness and respect are being increasingly overlooked in a world of anonymous electronic communications. What’s the solution? There can only be one solution of course, and I’m sure that by now you know what it is! 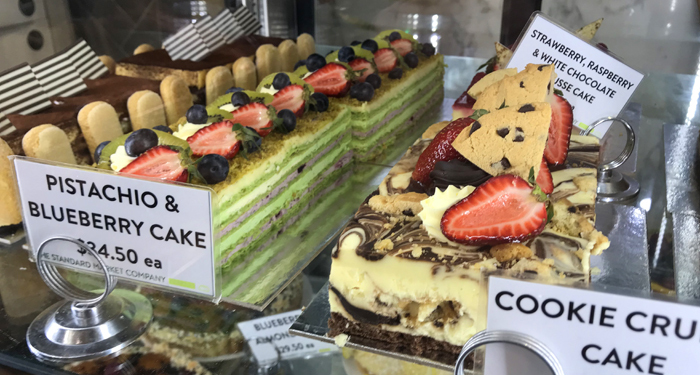 I found these little beaudies at Brickworks Bakery on Ferry Rd. I’d estimate each slab to be nearly a foot long. Say 280mm for those using decimals. A quickly crunch (sorry) of the numbers leads me to conclude that based on a generous sized slice 42mm wide you get 6.6666667 slices per slab. Not bad. That means six slices for you to enjoy, over as long a period as you can make them last (not long in my case), plus one modest ‘smaller slice’ of 28.014mm. And if you think those fractional sizes don’t matter try telling that to the kid who’s about to get the thinner slice. Personally I recommend avoiding all that drama and just slipping the smaller slice to your favourite ibis. I guarantee he/she won’t complain. In September I reported that Willy, the last of several young cygnets we’d had in care on Macintosh Island (central Surfers), was nearly ready for release. He was a bit young being two weeks away from flying but I couldn’t leave him there with the Gold Coast 600 due to start in a few days’ time. It would mean race cars roaring past his pond a mere 40 meters away. So, three days before the start of the race I caught Willy and took him out to Westlake, Robina. The release went well (left) and Willy looked happy in his new surroundings, however … looks can be deceptive. Shortly after I got a call about a cygnet in Broadbeach which was being attacked by older swans. ‘Describe the cygnet’, I asked the caller. ‘Greyish feathers, about three quarters grown, needy’ …. hmmm, many k’s from Westlake but does sound familiar. Next morning I drove to Broadbeach and found the bird. It was Willy alright. Unwilling to settle in Westlake it looks like he’d decided to swim home to Surfers and had strayed into the territory of dominant birds, none of which were being kind to him. Willy would have survived amongst those bigger swans but there was no need to leave him in an uncomfortable situation so I snatched him up as he bolted across someone’s garden with the aggressors in hot pursuit, then bundled him into my car. This time I drove to the far western end of Westlake and released him amongst two dozen grazing swans, most of which had their bum in the air and head well underwater. None paid Willy the slightest bit of attention. Perfect! Fast forward three weeks. No reports about young swans in trouble. 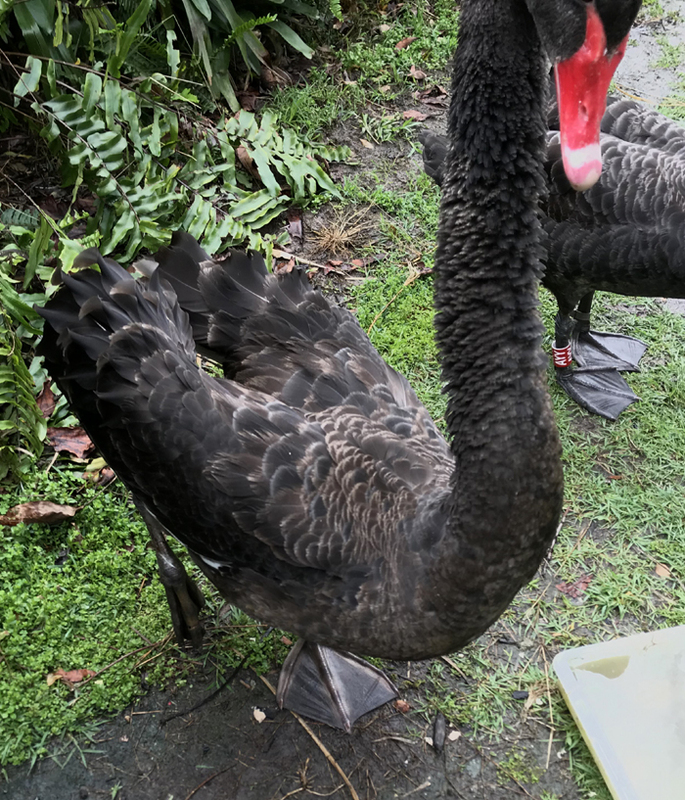 Then I hear from my neighbours that friends of theirs live on Westlake and have a young swan which has just started visiting. No prize for guessing who? (Pic at left) Not only does Willy enjoy sanctuary in their garden but he just struck the ‘mother lode’ when he discovered their vegetable patch, crammed with succulent lettuces. Apparently he goes in and helps himself. It gets better. I told them that he likes corn. Now he’s eating them out of house and home. None of this matters of course, they love him anyway. Thank you for your kind donations and support. Your help keeps ‘this show on the road’ which ensures that injured birds get the care they need. 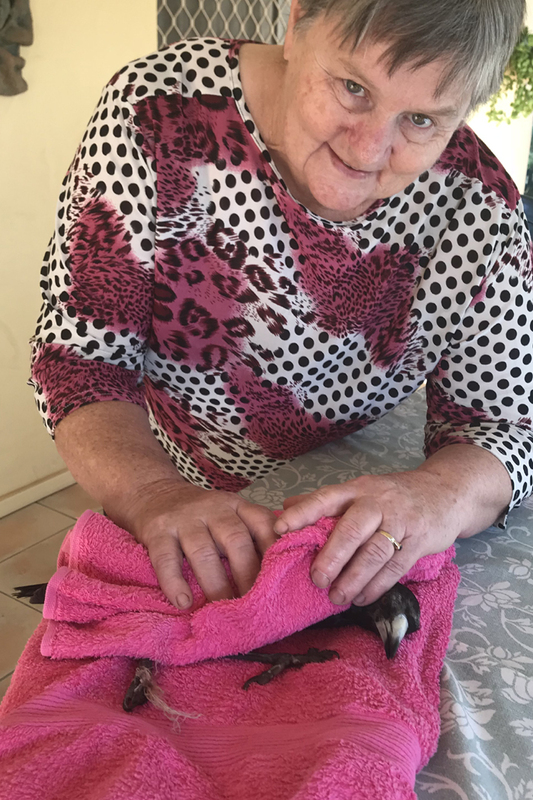 Wild Bird Rescues is in good financial shape at this time because of your generosity. Special thanks go to Liz and Paul on the Donations Committee and to our patron Jim Downs.